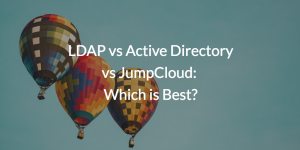 LDAP vs Active Directory vs JumpCloud: which is Best? Home » Blog » LDAP vs Active Directory vs JumpCloud: which is Best? When businesses talk about directory services they tend to throw around two terms: Microsoft® Active Directory® and LDAP. But we find that not many people know how or why the two services are different, or the various strengths and weaknesses of each. To help clear the confusion, in this post, we’ll talk about both LDAP and AD, and define a new cloud-based service that combines the benefits of each solution into one! Definition: Active Directory® has been the commercial market leading directory services solution for the past 15 years. While Microsoft doesn’t like to talk about AD as a “monopoly” with likely market share, over 90% of Fortune 1000 organizations use it. It’s clearly the historical market leader. Strengths: AD’s strengths are its ability to authenticate, authorize, and manage Windows devices and applications. 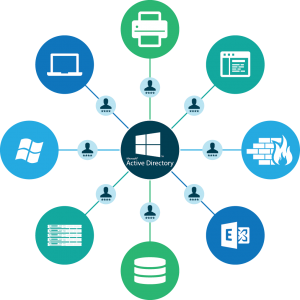 Through tight integration with Microsoft Exchange and the Domain Controller, users can effectively logon to the network and have access to whatever internal Microsoft resources they need. Weaknesses: The downside of AD is the time intensive management, lack of support for Mac and Linux platforms, and its inability to easily connect to cloud computing services. AD is installed on-premise and is delivered as a software solution. Azure AD is an extension to the on-premise AD that enables control over Azure Windows cloud servers and SSO to Web-based applications. Definition: LDAP is different from AD because it’s the “open source protocol” for directory services. This protocol has been instantiated into the open source directory leader, OpenLDAP™. Like most open source solutions OpenLDAP requires a significant amount of expertise and time to implement and operate. Strengths: The benefits of LDAP are that it is a standard open source protocol and its architecture is highly flexible. It can manage Linux and Unix systems better than AD. Further, technical applications are often connected to LDAP. Weaknesses: However, it’s flexibility is also limiting. Because of LDAP’s flexibility as a protocol, it requires IT admins to spend more time configuring and setting up both the server side schema, and how each device and application will authenticate to the server. It should be noted that LDAP’s specialty is authentication and authorization. Unlike Microsoft Active Directory, LDAP does not inherently manage devices. OpenLDAP is largely focused on solving authentication and authorization needs for more technical devices and solutions (i.e. Unix / Linux devices, and technical applications). Additionally, LDAP does not easily connect to Windows devices and applications as well as cloud infrastructure and SaaS-based applications. Definition: JumpCloud® Directory-as-a-Solution® is the industry’s newest directory service solution, designed for a more modern workplace. Commonly, JumpCloud is a cloud-based directory solution (DaaS) that can authenticate, authorize, and manage users, devices and IT applications. DaaS is from the cloud and built for the cloud. It’s cross-platform nature enables it to function as a superset of AD and LDAP. Strengths: DaaS allows organizations to leverage the benefits of both AD and LDAP in one cloud-based directory. DaaS solutions authenticate, authorize, and manage users across the major device platforms (Mac, Linux, and Windows) as well as connecting users to cloud infrastructure (cloud servers and Web-based applications). DaaS leverages the LDAP protocol where needed, but adds other authentication protocols when necessary enabling more device and application types to be managed. Weaknesses: Directories are core to a business’s infrastructure and security. The main question we are asked with DaaS is whether the directory can be secure in the cloud. In reality, JumpCloud secures servers and tightly knits processes to enhance business security and user management. What Directory Service will You Choose? For organizations thinking about whether to use Active Directory or LDAP, they should sidestep the decision and choose a solution that gives them the best of both worlds, DaaS. To learn more about Directory-as-a-Service solutions, contact JumpCloud. Alternatively, try our cloud based directory free and see for yourself. Your first 10 users are free forever.